So I am not one to fake tan EVER, this is the first time I've ever used an at home self tanner. I have never gone to a tanning salon spray or bed. Of course I like to look tan in the summer months but I like it to look natural. I don't like looking orange or fake. Never would I want to be mistaken as a worker for Willy Wonka. But in this months Ispy (Glam Bag) I received a mini bottle of St. Tropez Instant Glow Body Lotion. So I thought what's the worst that can happen. I'll try it and if I don't like it the bottle says one nights stay and that it comes off with soap. And all I have to say is OMG it was not good. I looked so shiny and orangey brown. I looked like I rubbed shoe polish all over my arm. Which is not a very good look. It applied okay, But the finished look was not something I would want to be seen looking like. Another thing I really didn't like was that I have dark hair and it made the hair on my arm more prom ante which no woman wants. I feel like a natural tan helps hide some of that as where this made is way worse than it needs to be. Now I'm not trying to say St. Tropez is a bad brand and that you shouldn't self tan, it's just that it's not the thing for me. I know they have a mouse self tanner that I've always wanted to try and have heard great things about. So maybe some day I will try that one. 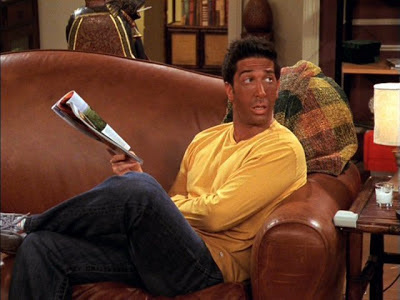 My biggest fear is looking like Ross Geller from Friends. When he decided to get a spray tan. If you are naturally pale embrace it. Take care of your porcelain skin. They're is nothing wrong with being fair. Embrace what you were born with. Or tan naturally, As long as you don't over do it and use sun screen. And who knows 20 years from now scientists might be telling us faux tanning is bad for us. If you've tried this product or a similar one id love to hear how you liked it. haha I always end up streaked! No matter how much I try to make sure I blend it in well.